This is a sensitive topic for some people who believe that technology should not be part of the sacrament meeting, while others believe that there is nothing wrong with using devices in the chapel at all. Either way, here are some great ideas for everyone to consider. Consider these three principles for using devices appropriately in the chapel. One Sunday while the sacrament was being passed, a ward Relief Society president I know pulled out her smartphone to read “The Living Christ: The Testimony of the Apostles.” Inspired by this apostolic testimony of the Savior, she felt renewed in her commitment to always remember Him. However, her positive feelings melted away a few days later when, in the mail, she received an anonymous letter from a ward member. The author criticized her for setting a bad example by being on her smartphone in sacrament meeting. She was crushed. Certainly, she hadn’t meant to offend anyone by using her mobile device. She rarely used it in the chapel, and only then when she felt it was appropriate. But after receiving the letter, she began to doubt herself. Every generation has its challenges. One study reports that by 2020 there will be more people with a mobile phone (5.4 billion) than with running water (3.5 billion).1Add in tablets, “phablets,” and other connected devices, and you get a world that is wrestling with the question: What is appropriate “digital etiquette”? As parents, leaders, and teachers struggle to decide what is appropriate digital etiquette in Church settings, different opinions have led to sometimes conflicting ways to handle digital devices in Church meetings. Church leaders have provided counsel on the blessings and dangers of using technology. However, Church leaders don’t always spell out all of the do’s and don’ts of gospel living (see Mosiah 4:29–30). Members are expected to study the matter for themselves and seek the guidance of the Holy Ghost in making decisions. Unfortunately, as in the situation above, sometimes we adopt not only a position but also a critical attitude toward those with a different position. God has provided the blessings of technology for our benefit and the advancing of His work. 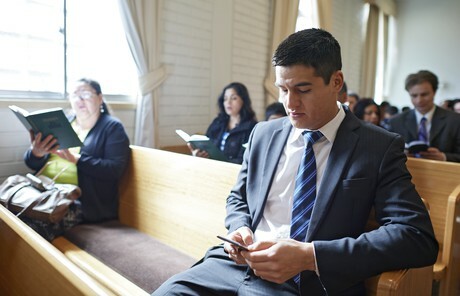 So while some members use their digital devices inappropriately, Elder David A. Bednar of the Quorum of the Twelve Apostles has taught that “we should not allow a fear of mistakes to hold us back from receiving the great blessings these tools can provide.” We need to learn to use them appropriately and teach our children to do so as well. Mobile devices help members of the Church with gospel study, family history and temple work, and sharing the gospel. For example, over three million people used the Gospel Library app in January 2018. Their combined study time equaled more than a thousand years. Along with noting the blessings, Church leaders have warned about the potential dangers as well, including wasted time, damaged relationships, and entrapment in sin. In Church settings, inappropriate use can distract us and others from worship and learning that are crucial to developing our relationship with God. Here, we examine principles that may be helpful in making decisions about using mobile devices in sacrament meeting. For a discussion on appropriate use of digital devices in the classroom, see “Teaching with Tech: Engaging Youth in a Digital World” by Brother Brian K. Ashton, Second Counselor in the Sunday School General Presidency, on page 56 of this issue. Principle 1: My choices support worship. Sacrament meeting is for “[paying our] devotions unto the Most High” (D&C 59:10). President Dallin H. Oaks, First Counselor in the First Presidency, taught that our focus there should be on renewing our covenants and our faith in the Lord Jesus Christ and His Atonement. What we choose to do in sacrament meeting should help us do those things.